June 17, 2006, 11:53 PM · Dedicated theme park fans love the first day of passholder preview for any new attraction. It's your first chance to experience a fresh new ride, while collecting bragging rights for getting on that ride before anyone else. Unfortunately, those benefits come at a cost -- you'll often end up waiting longer in the queue for that ride on its passholder preview day than anyone will have to wait for that ride ever again. Hence the two-hour wait Saturday for Splash Battle, the new aquatic shoot-'em-up at Legoland California. I doubt anyone will encounter such a long wait for this clever little ride, at least after the non-passholding public gets its shot at it next weekend. 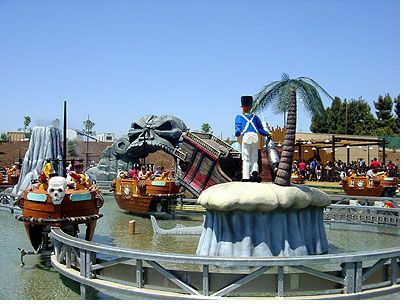 With a more reasonable wait time, this Pirate-themed attraction from Preston & Barbieri will demand multiple rides from eager kids, and probably more than a few parents. Up to four passengers ride in each boat, which runs on a track above the water in Legoland's new "Pirates Shores" themed land. You sit back-to-back, in rows of two, with each rider manning his own water cannon. The serpentine track brings each boat in range of other boats on the ride, as well as spectators watching from the shore. This is no one-sided battle, however, as the spectators are armed with water cannons of their own, which they use cheerfully in soaking each passenger on the ride. The grown-ups, of course, provide the biggest, and most tempting targets. Being the first day of public operation, several of the cannons failed to work, however, including those on a few of the boats. Perhaps the problem will turn out to be nothing more than an opening day glitch. But if this turns out to be persistent, it threatens to cripple the appeal of what otherwise promises to become one of the highlights of a visit to the Carlsbad, California park. Bring a swimsuit and a change of clothes if planning to visit these play areas, as a light misting is not an option. Soak N' Sail dumps water by the hundreds of gallons -- throughly soaking anyone present. Kids loved it, but this is strictly a water park-style attraction, and not something to be experienced in one's "normal" clothes. 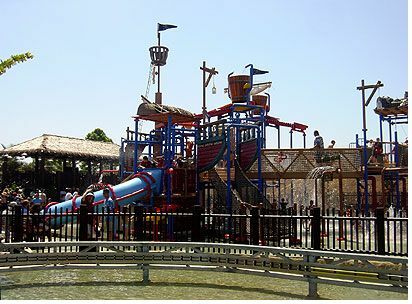 Pirate Shores opens to the public on June 21.